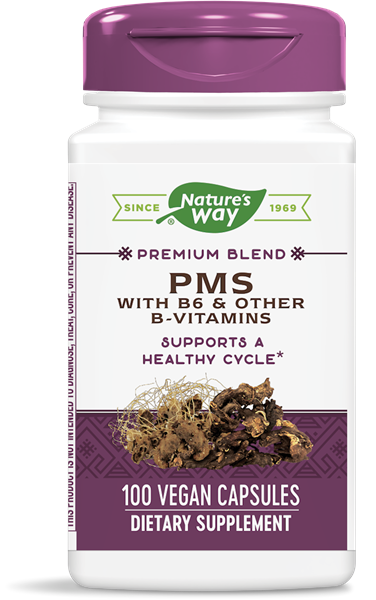 PMS / 100 Caps - Nature's Way®. At Nature’s Way®, we believe nature knows best. That’s why our mission is to seek out the best herbs the earth has to give. We will go to any continent or country to find where herbs grow best, so we can bring you the purest botanicals possible. It’s the way we deliver uncompromising quality and the way to help you live healthier. It’s not just our way, it’s Nature’s Way. Do not use if pregnant or nursing. Discontinue use and consult a healthcare professional if you have a liver disorder or develop symptoms of liver trouble, such as abdominal pain, dark urine, or jaundice. Persons with allergies to plants of the Asteraceae (Compositae) family, including ragweed, should use this product with caution. If taking any medications, consult a healthcare professional before use. Popular bitter with a long history of use as an herbal remedy.